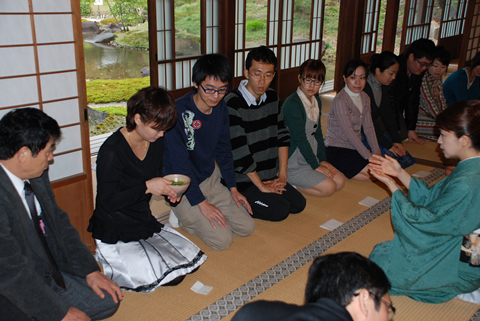 Visit to the historic Enkakuji Temple in Kamakura for experience in tea ceremony and Zen meditation to foster greater understanding of Japan's traditions and culture. 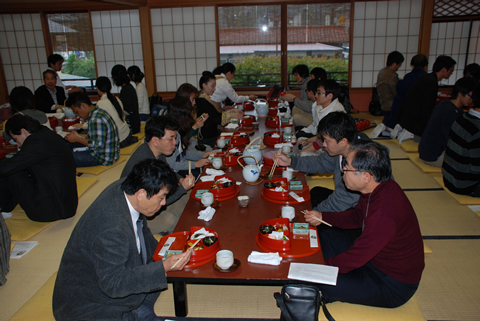 Traditional "Kaiseki" lunch was served for lunch. Filling youself up may not have been good for Zen meditation practice scheduled later! 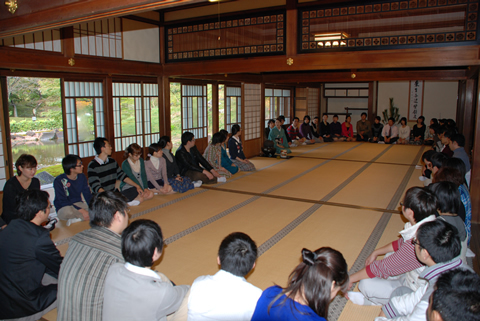 Tea ceremony was held at the large hall of Enkakuji. 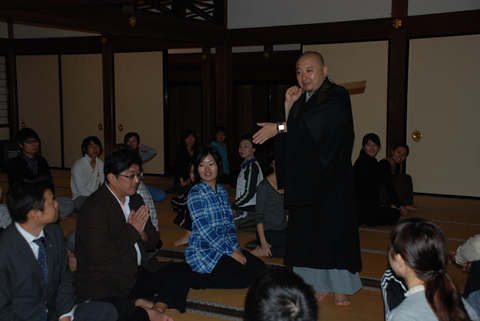 Urasenke Master Soten Kuwahara taught the students who are neophytes at this very kindly and patiently. 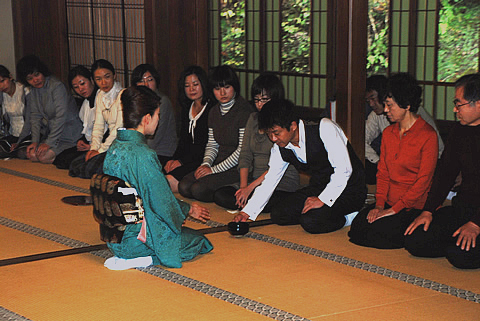 Chairman Akimoto and scholarship student being taught "koicha" by Master Kuwahara. 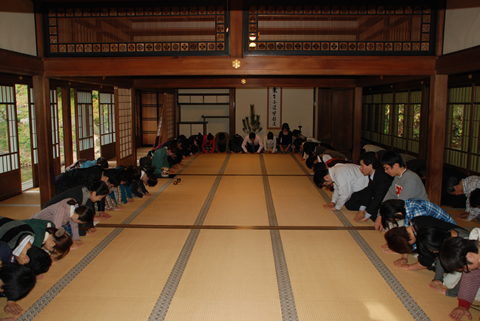 The lesson ended with everyone practicing the farewell bow in the Urasenke style. 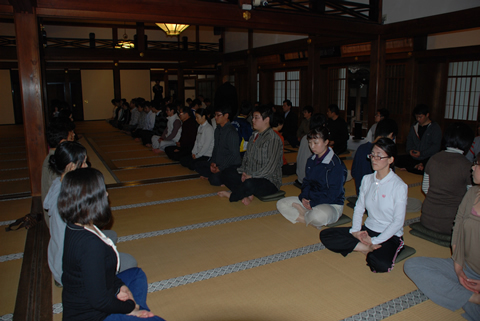 Enkakuji priest and head of educational affairs Eon Asahina personally instructed the students on Zen meditation. 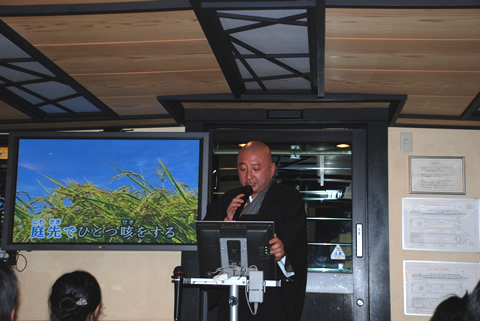 Before starting medication, the use of the "keisaku" (warning stick) was demonstrated with Foundation contributor Mr. Nakagawa. 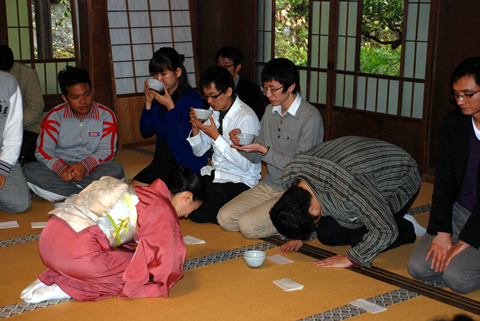 This begins with the priest and the practitioner bowing to each other. 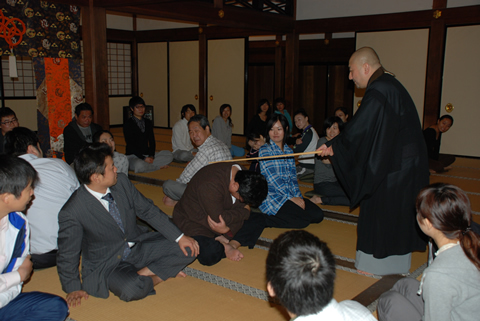 The slap of the stick resounded throughout the hall, making the people on both sides of Mr. Nakagawa jump a little in surprise. 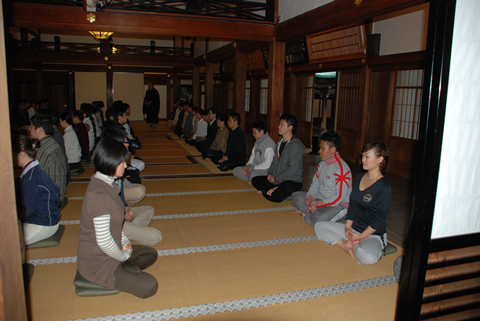 The meditation session proceed quietly. Time passed very quickly in the silence. 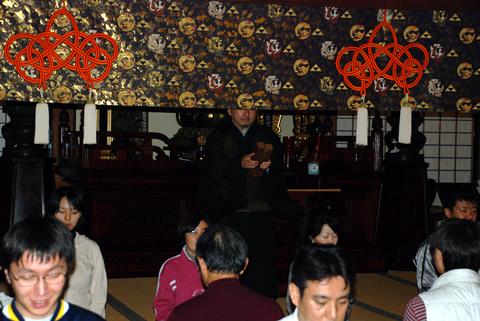 Priest Asahina announced the end of the session with clappers. 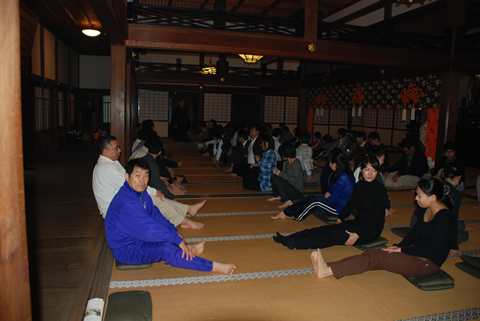 After the session, everyone relaxed by stretching their legs. It was a short but very enriching session. 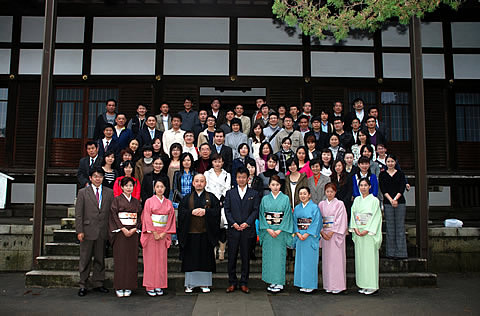 The group took a commemorative photo with Priest Asahina, Urasenke Master Kurahara and her disciples in front of the temple's main hall. 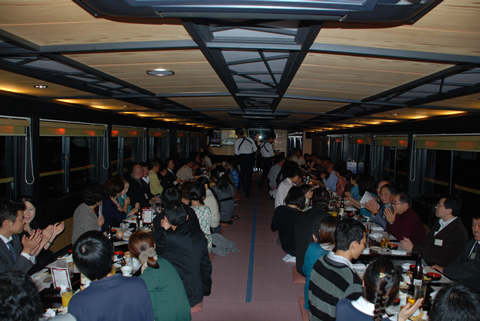 The goodwill party on board the Yakatabune turned out to be fun with karaoke singing. 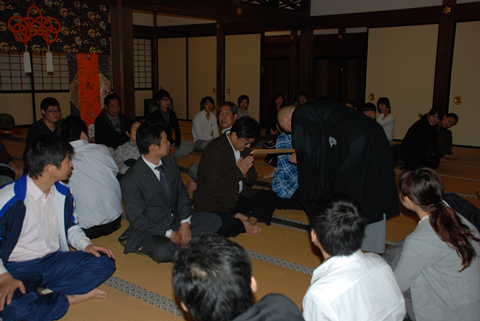 Priest Asahina who taught Zen meditation sang "Cosmos." 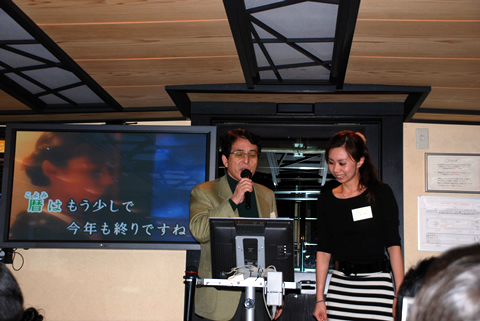 Former scholarship student Ms. Guo Tian Tian sang "Yukiguni" with Director Shingo Ogawa. 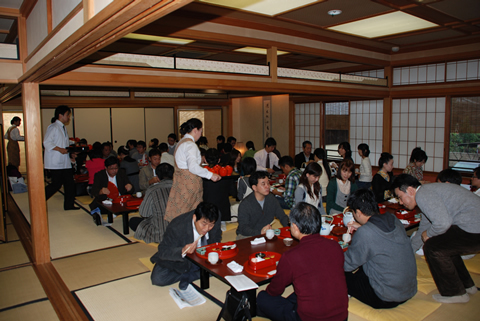 Ms. Yang Seol Rang of University of Tsukuba delivered a splendid rendition of "Kawachi-otokobushi." 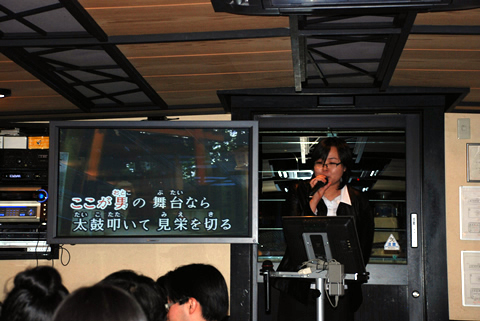 She sang like a professional singer and drew tremendous applause from everyone on board the boat.